Fact: I prefer brown sugar over white sugar. I’ve been known to dig into a bag of brown sugar with a spoon, but I can’t even imagine doing such an act with white sugar. For this reason, I find it a great tragedy that so much of the world has never tasted brown sugar pie. This is a creation intended for people possessing a powerful sweet tooth. Folks who utter sentences like “It’s just so cloyingly sweet!” and “Those made my teeth hurt!” need not apply. Essentially, what you’ll find with this pie is a soft, creamy, custardy filling replete with rich brown sugar flavor. As my grandma (the source and frequent baker of this recipe) can attest, the appearance of the pie that comes out of the oven isn’t always predictable. Sometimes it can be runny, while other times it sets up just perfectly. Sometimes there are pock-marks along the surface, while other times it’s completely crater-less. Regardless of how it looks, though, one thing remains constant—the flavor. A thin thick slice of this sweet treat is a welcome and fitting conclusion to any meal. As this recipe has been handed down from my dearest grandmother and definitely counts as a family favorite, I'm sending it along to Lynda of Lynda's Recipe Box for the "Family Recipes: Memories of Family, Food and Fun" event. I, too, prefer brown sugar to white. And this pie sounds amazing! OMG, that looks to die for!!! I'm keeping that fabulous recipe! Yum it looks so sweet and good! Happy Holidays to you too Grace! It *looks* delicious, but I'm one of those folks that think some things are too sweet. I like that this is a little different each time you bake it, and you always get a little surprise! The brown sugar filling sounds amazing. brown sugar pie?! too awesome! brown sugar is way cooler than white sugar! I'm with you on brown sugar it is superior to whie. Hey, is this similar to chess pie? This looks fabulous! Sounds like pecan pie without the nuts. Happy Holidays!! I love brown sugar! Put it in a pie and I'm sure I'd be a happy girl. Merry Christmas to you too! I LOVE brown sugar, and I don't even think I need to tell you I LOVE pie. This is on my DEFINITELY need to try list! Oh man, that looks insanely good! This is a killer. Looks so good. I'm with you...long live brown (especially dark brown) sugar. I'm definitely giving your grannie's recipe a try. It looks fantastic and seems to suit just my tastes. I am just the same Grace, I try to make every recipe possible a brown sugar recipe rather than the white. I for sure would not complain at the sweetness because of the simple fact that it is brown sugar and not white, lovely. This looks like such a delicious treat, lucky you having your grandma bake this for you! I'm afraid I fall into that category of folks who have not only never had this pie, but have never even heard of this pie. I feel like I'm missing out. I've never had a brown sugar pie... *as I tilt my head down in shame*. I need to try this soon! Did you say brown sugar pie??? Wow. I wonder how I got through this much of my life without ever having tasted such a delightful creation!! Brown sugar pie sounds amazing! A timely recipe for me as we've been snowed in since last Saturday when I've discovered I was completely out of white sugar. But you know what I didn't really miss it and used brown sugar or agave in all the recipes instead. damn girl, a spoon into the bag of brown sugar? wow, you have me beat there. this is a cavity inducing pie. is it wrong that I would want a small slice of cheddar cheese on the side with this? Wow, that is one sweet treat! I say it's on my New Year's "To Try" list! Merry Christmas, Grace and kitties! It must have the most wonderful, rich, molasses flavor ever... Seriously drooling there... Merry Christmas! I love brown sugar too! I usually use it in my tea or coffee as it has that beautiful caramelly flavour. Grace, this pie is genius! How could you not love something called Brown. Sugar. Pie.? Oh ya, it's like PECAN with no pecans! MY FAVE! Pies are not often my first dessert choice but if I had Granny Fannie's pie to choose from it would be a whole other story! You're not going to believe this Grace, but I've NEVER had this pie! But I really am intriged and dying to try it...I too, can eat brown sugar and love every grain, so this pie sounds amazing to me! Have a very Merry Christmas, Grace, and thanks for the submission! This looks to die for! I'm a brown sugar person also. My 5 year old daughter loves brown sugar too! Thanks for sharing your Grandma's recipe! My hubby would find this cloyingly sweet and I would have to whole-heartedly disagree...as if such an idea even exists! This would be a wonderful treat! Hi Grace, I'm so pleased to see this common affection for brown sugar coming out in everyone! As my rendition of your impossible coconut pie attests, I'm all in favour of trying out molasses rich sugars in place of white sugar. The end texture is always different than one white sugar creates, but even this is usually better, I think. Always more chewy... and who doesn't love chewy! This pie looks insanely good. I'll add it to my list of Christmas Day activities! 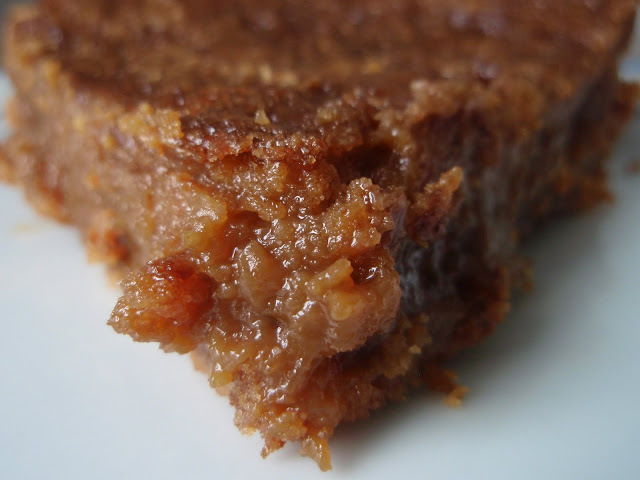 I love the flavour that brown sugar lends to baked good, it just makes them better! !We hope your Christmas is filled with joy, laughter and many kitchen successes in the New Year...you never know what 2010 will bring. Brown sugar pie, oh my! WOW... that looks incredible... I think that may be the perfect pie for ME... I'm running off to the kitchen NOW! Oh yes, Brown Sugar is the best! wait....what??? brown sugar pie? why have I never heard of this awesome creation!! my oversized sweet tooth is beggin for a thick slice. brown sugar is so fragrant. awesome on creme brulee to caramalize too! Oh, Grace, this is SO SOUTHERN! I love this pie, but I've never had a recipe. A big thanks to you and to your Grandmother. Happy Holidays to you too. I'm glad I found your blog this year. Happy holidays!! I'm sure your family will be treated to some of your delicious creations. Happy Holidays Grace. I hope you are enjoying some time with family. And wow a spoon in a bag of brown sugar- girl you got it bad. Merry Christmas! That pie just looks ridiculously good. I love that gooeyness in the middle. Umm wow that pie looks amazing. I might possibly also eat brown sugar straight from the bag :) brown sugar is seriously my favorite baking product- it makes everything better haha! That second shot is the money shot, absolutely gorgeous! Oh my goodness, I know I would LOVE this! Thanks so much to your gram for the recipe. This looks phenomenal! Happy holidays to you Grace! I prefer brown sugar too but I don't think I can manage this with 3 cups of brown sugar! The texture looks really good though. Happy holidays! I think I gained three pounds just reading this... pass the pie!! :) Happy holidays to you and yours! Happy holidays and best wishes for a NEw Year Grace. That is one awesome looking hunk of sweetness! That looks fabulous!! I, too, love brown sugar. It must be the molasses.. You know us southerners.. we do love molasses! yum!! 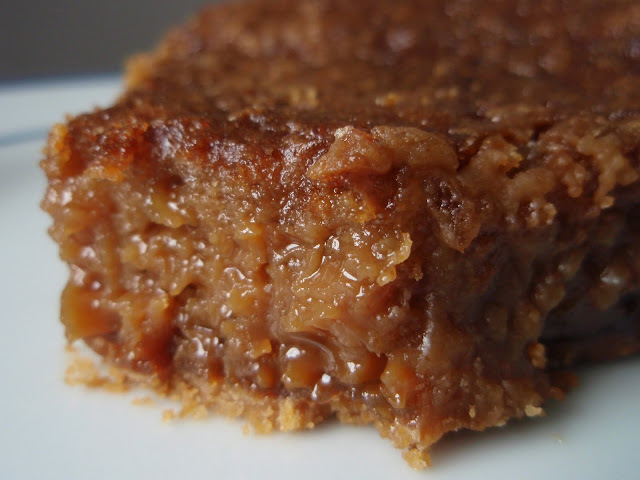 brown sugar custad pie. What do think a pinch of fresh grated ginger would do to it? gingersnap custard pie? Oooh, brown sugar...definitely so much better than white! This pie looks so incredibly decadent and almost reminds me of a pecan pie without the pecans and with yummy brown sugar in place of the corn syrup...perfection! Happy Holidays to you and yours, Grace! I was drawn in with the first viewing and I'm anxious to browse and try some of the goodies you share. Happy New Year. I'm in that, can't take too much sugar boat. I'll just admire how moist it looks. Happy Holidays! I'm drooling over my computer at work just looking at the pictures. This looks delicious! I can see why it's a family favorite :)! I LOOOVE BROWN SUGAR! It's so yummy, but I don't think I've ever inhaled it with a spoon :). THat is an intense looking pie. I'm impressed and the gooey factor is definitely going strong--lookin' good, lookin' good! Hope you had a Merry Christmas, Grace! I've missed your fun and tasty posts--have a great New Year! This looks, well, AMAZING. Yum, yum -- I will definitely give it a try!! Happy Happy New Year to you Grace!! This sounds so good! I love brown sugar. I wonder if I could make a very small one just for me? No way will my husband eat this! I too am a brown sugar fan. The pie looks awesome! Thanks for joining us in the Family Recipes Event! Awesome submission! Love it. Weirdly, although I am one of those people who can find some desserts too sweet, I also can eat brown sugar with a spoon. I may have, ahem, trained my kids to do the same. I am so ashamed. 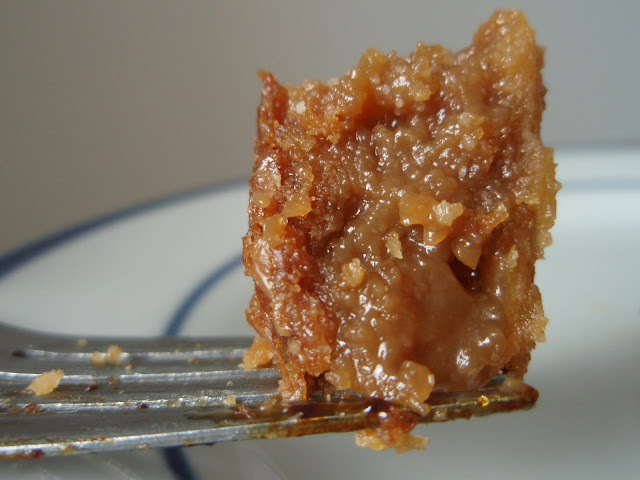 I'm going to try this using DARK brown sugar - I REALLY love brown sugar - I will eat it with a spoon just like you do.... I am also going to let the filling mix sit for about an hour. Doing so allows the sugar to go into solution rather than simply be in suspension (it's chemical but it means the sugar really bonds with the other ingredients.) The advantage here is that it carmelizes more when it bakes, giving it an even more extra-special flavor! Wow. I can totally eat brown sugar by the spoonful. It's that damn good. White sugar? Not so much. I am sooooooooo making this pie as soon as possible. Thanks for the recipe. This pie is amazing. I cannot stop eating it! It's like pecan pie without the pecans but BETTER. So, so amazing. Thank you for this recipe! This pie is very similar to mamafuko's crack pie. The crust is made like a cookie, but the pie sounds like it. I can't wait to make it. Those sentences referring to too sweet shall never be uttered from my lips. I cannot wait to try this pie. I am mentally checking my stock to see if I have what I need to make it. Thanks soooo much for the recipe. My oh my, I really DID (or should I say did NOT) need to find this recipe. Can barely wait to make it. Thanks for sharing! @Renee D: my pleasure! this pie is definitely one of my absolute favorites, and it's perfect for holiday celebrations! I passed this recipe to my sister, as I do all dessert recipes. One pie seemed to set up ok but was still a little runny in the center, the other is completely runny so it's in the fridge. However, the pie is delicious. We are from the south, south GA, and have never heard of a Brown Sugar Pie. We may have to tweak the recipe next time to make sure they set properly but it's definitely a keeper. @LovingMeNaturally: you're right--sometimes the pies don't turn out so beautifully, but they're always delicious! Oh.My.God. I am making these for the 3rd time today since I found the recipe on Pinterest 2 weeks ago, and they are just the most delicious thing I have ever eaten! Bravo! Never heard nor had this pie, will be making it soon, looks wonderful. Quick question Grace I see margarine in this can butter be used instead since I abhor margarine LOL? Do you pre-bake the pie crusts first? Can you make this with two eggs so it's not quite so custardly? @Anonymous: I don't see why not; in fact, I think that's a great idea and definitely worth a try! Scrumptious. I've made these with this recipe a few times...and today is no exception. One is in the oven now. Ty for sharing this deliciousness with us! I have a recipe for pecan pie that is very similar to this. It is my absolute favorite pie recipe as well as my family's favorite. I don't like the recipes for pecan pie using Karo but love this recipe. I am going to try to make this pie without the pecans and see how everyone likes it. Thanks! Hi.. this pie looks delicious. I'm looking to make it for New Year's. Just a question.. Is it three cups packed brown sugar? Or will this recipe work with just one box of brown sugar? Lol.. I won't say a word :-) Thanks so much. I can't wait to make!! Oh wow! This looks dangerously good. And I'm with you on the brown sugar vs white! All the way! I LOVE Brown Sugar Pie! So amazing! Do you use light or dark brown sugar and do you think a thin layer of melted chocolate in it somewhere might be good? Hi Grace, I hope you're still responding to comments. I tried your recipe last night and it never set. I had a homemade regular pie crust, so I cooked it 30 minutes. Like a waterbed in there, though the top was nice and caramelized. I decided to up the oven to 375 and put foil over the top, cooked it another 40 minutes. Same deal, but it was mostly the inner circle that was still runny. We put it in the freezer for two hours after it cooled and it helped, but quickly started to "melt" and get runny again. ...forgot to mention, I followed the recipe except that I used unsalted butter instead of margarine. I just wonder, why do you publish comments with questions in them if you don't answer them? I guess I'll have to try a different recipe, I was hoping for some advice on yours. @Rain: I'm so sorry that happened! I would suggest adding just a bit more flour, maybe another tablespoon. Ovens vary so much, as do eggs. I have used margarine before with success, so I don't think that's the problem. I think a little more thickener will help immensely, and I surely hope it does! @Rain: So sorry, I've been on my honeymoon and took it upon myself not to do anything except enjoy my husband and the beauty of Ireland! Your response is above. I remember having this as a child. Delicious! Thanks for the recipe. My husband's Aunt Pearlie made Brown Sugar Pie. She used cream or evaporated milk and put meringue on top. Yum, yum.